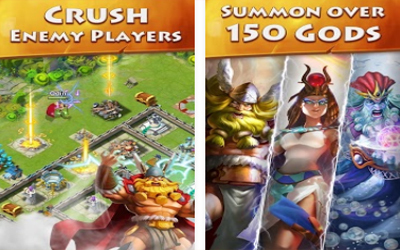 Published by Aeria Games and developed by U9 Time, Dawn of Gods APK 1.4.3 is the latest strategy game has just been released on Android. For you lovers of Clash of Clans, maybe this game could be an alternative if you want to try a similar strategy game genre. In this game the players are required to build and expand his empire by means of defeating other players. Players must summon the gods of mythology past to assist their soldiers in achieving that goal. Players can take advantage of gods such as Zeus, Odin and many more, because there are more than 150 gods and goddesses of mythology are different in this game, which is taken from Norse, Greek, Egyptian, and other mythological. Each god has a unique skill that can be used on the battlefield, and they will continue to grow stronger as the experience can be. The players can sacrifice a god who is weak to strengthen their main deity. Even god can also be reborn in the form of stronger again. Dawn of Gods includes six battle modes are varied, some of them there are single-player Conquest mode, where players search for the location of cities around the world to carry the loot, then there are PvP Battle mode where the attack carried out to determine the position of the players on the leaderboard. As a newly born God, you must unite the other Gods of the world’s ancient cultures under your leadership. Use their power in combat to destroy enemy player bases and defend your own. There is also a multiplayer mode that can be played with friends by forming alliances, before the fight. The Gods got a facelift with a brand-new app icon and launcher screen! Our Gnomes have been hard at work, and have fixed some battlefield display issues. I love this game. It is by far good strategy game for mobile devices. The armies are familiar so that if you have played other strategy games, you will feel at home.